BYU’s Larsen Yellowstone Collection reveals the colorful history of the world’s first national park. (Above) Grand Canyon of the Yellowstone is one of 15 chromolithographs in Louis Prang’s portfolio The Yellowstone National Park, and the Mountain Regions of Portions of Idaho, Nevada, Colorado, and Utah. Appraised at $350,000, the portfolio is the most valuable piece in BYU’s A. Dean Larsen Yellowstone Collection. (Below) This 1936 copy is similar, if not an exact match, to the Haynes Guide Dean Larsen purchased at age 10. It was the first piece of Yellowstone memorabilia the BYU librarian ever owned. Before the heat of the summer of 1940 set in, and before the rationing and tight living the next year’s entrance to the war would bring, Ariel and Vera Larsen piled their children into a 1936 Packard and drove to Yellowstone National Park for the opening of fishing season. Fishing Bridge was only three years old then, and from there the Larsens cast their lines into the Yellowstone River, hoping to pull up some of its famed cutthroat trout. Sometime during the days of fishing, hiking, and geyser watching, 10-year-old A. Dean Larsen (BA ’54) set down his fishing rod and wandered into a souvenir shop near Fishing Bridge. Sneaker-shod and overalled, he sauntered past the rows of Old Faithful key chains, collectible postcards, and other assorted kitsch and stopped in front of a copy of Haynes Guide to Yellowstone National Park. The guidebook, with its bright, blue-and-yellow cover depicting a stylized geyser, held his attention. Dean pulled a few coins from his pocket, paid the attendant, and walked back into the sunshine clutching the first piece of what would become one of the finest collections of Yellowstone materials in the world. “From the first time he visited the park, Dean just immediately became interested in pamphlets and guides and maps of Yellowstone,” says his wife, Jean Maycock Larsen (BS ’53). 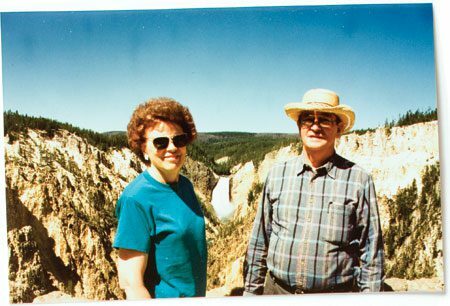 When Dean married Jean in 1958, they began a 40-year tradition of visiting Yellowstone once or twice every year. Throughout those years the Larsens added to their collection of Yellowstone materials, aided by connections and friends Dean made as the director of collections development at the Harold B. Lee Library. 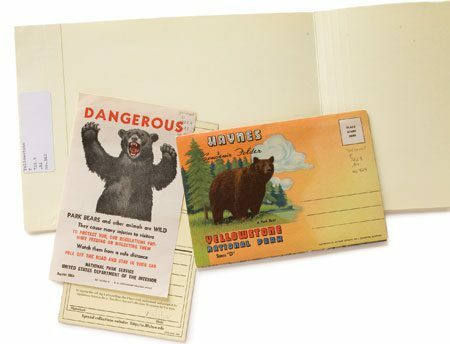 By the time they donated their collection to the L. Tom Perry Special Collections in 2000, it comprised roughly 2,000 items—items as varied as “do not feed the bears” flyers, firsthand accounts of trips to the park, volumes of academic research on Yellowstone’s bears and wolves, and colorful 1880s railroad circulars advertising vacation packages. 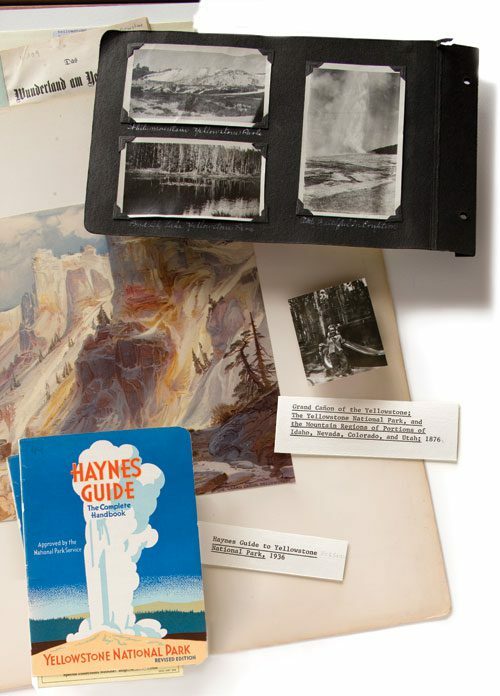 The Larsen Yellowstone Collection substantially increased in size in 2006, when Ron and Jane Lerner, friends of the Larsens, donated their equally sizeable and valuable 800-plus piece collection of Yellowstone materials. 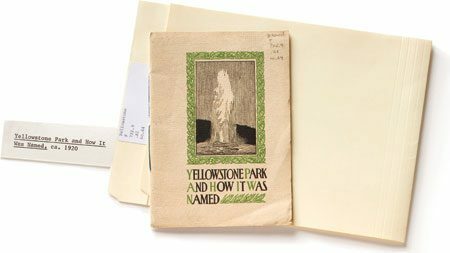 The Yellowstone Collection’s many pieces of ephemera – items such as pamphlets, maps, booklets, and postcards originally meant to be discarded – are now collectibles that provide a window to the park’s history. Reliable information about the Yellowstone area was scarce in the 19th century. Trappers and explorers reported, as cited in numerous Yellowstone histories, craters that “issued blue flames and molten brimstone” and springs “so hot that meat is readily cooked in them.” With a tone of awe, most people simply called the place Wonderland. In 1871 the government commissioned renowned surgeon-turned-geologist Ferdinand V. Hayden to survey the area, collect geological samples, and separate truth from fiction. Hayden’s expedition included photographer William Henry Jackson and painter Thomas Moran, a late and somewhat unlikely addition to the group. Their ostensible purpose was to provide artistic proof that this Wonderland lived up to its name. Hayden, however, had a slightly different plan for his guest artists. He wanted them to help set the stage for one of history’s greatest acts of conservation. For months, Moran sketched and painted, Jackson labored over his heavy photographic panes, and Hayden’s team took meticulous notes. Jackson’s stunning photos of the Grand Canyon of the Yellowstone—several of which reside in BYU collections, along with much of his other work—present its grandeur and jutting angularity with scientific exactness. But as Hayden later wrote, a black-and-white picture of Yellowstone “is likeHamlet with the part of Hamlet omitted.” Moran’s paintings supply the missing link—color. His brushstrokes contrast the blue-green of the river with the stunning mineral hues of the canyon walls—chalk white melting into terra-cotta, pushed up against rust and burnt brown. When the party returned east, Hayden submitted his report and began lobbying Congress to set aside more than 2 million acres of land as the world’s first national park. According to many accounts, the success of Hayden’s efforts leaned heavily on Jackson’s photographs and Moran’s art. 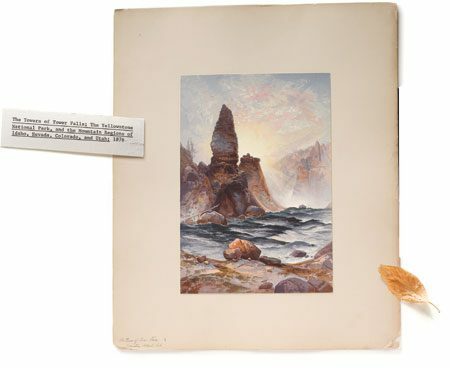 The Towers of Tower Falls, like all of the chromolithographs in the Prang portfolio, is a reproduction of a Thomas Moran painting. While Moran originals remained the province of the wealthy, Prang’s chromolithographs made the works of Moran and other artists available to a broader audience. To Prang, chromolithography was the democratization of art. Riding on the coattails of the national excitement over Yellowstone, Bostonian Louis Prang commissioned Moran to paint a series of pictures from his time in the West, with the intention of creating a portfolio of chromolithographs—or color reproductions—from the paintings. Some critics alleged that chromolithographs were cheap imitations, but Prang wanted to offer everyday Americans access to affordable fine art, and reproducing the work of a respected artist like Moran lent weight to his cause. Published four years after Yellowstone National Park was established, the Prang portfolio—officially titled The Yellowstone National Park, and the Mountain Regions of Portions of Idaho, Nevada, Colorado, and Utah—is the centerpiece of the Larsen Collection. One thousand copies of the portfolio were produced by Prang by 1876, however only about 150 were initially sold. The other 850 copies were destroyed in an 1877 fire. BYU’s copy is one of the few that still exist in complete form. It came to the university in 2007 through the generosity of collectors Ron and Jane Lerner and donors Rex G. (’62) and Ruth Methvin Maughan (BA ’60). 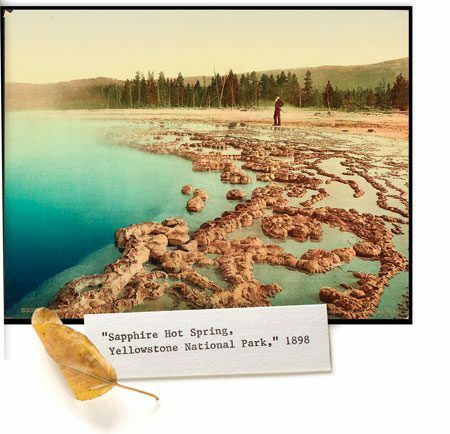 This hand-colored photograph was taken by William Henry Jackson, the first person to photograph the wonders of Yellowstone. Jackson’s photographs aided in the effort to create the world’s first national park. BYU own 56 of Jackson’s original Yellowstone images. Spurred on by articles in popular magazines and images like the ones Prang produced, tourists began traveling to Yellowstone almost immediately after its inception. Jane Washburn and her husband were among the first generation of adventurers to experience the park after the railroad reached it. Her referencing Moran’s painting—which in fact takes many artistic liberties—is evidence of the powerful effect the images had in creating the American West in the minds of easterners. Even those who could not come to Yellowstone in the early days felt a certain pride for this national wonder. “From very early on there was a real sense of Yellowstone as a national possession,” says Susan Sessions Rugh (BA ’74), associate professor of history, whose recent research on the history of travel and tourism in the United States drew from the Larsen Collection. 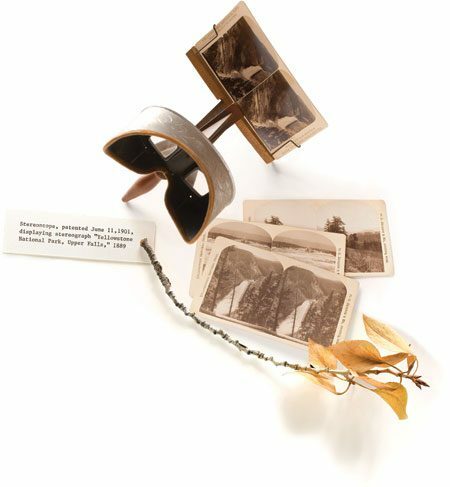 This feeling of ownership may account in part for the proliferation in the late 19th century of Yellowstone images, such as those made for then-popular devices called stereoscopes, which give photographs a three-dimensional effect. One of the many stereoscopes housed in the Larsen Collection is a device made from a dark metal, with swirled coppery accents and a worn wooden handle. Getting the scene of Yellowstone’s Grand Canyon to come into focus requires a bit of tromboning, but the moment it does—tall pines springing out from the frame, steep canyon walls stepping forward, and the powerful spray of the 308-foot-tall Lower Falls receding into the distance—it’s easy to see how people in the East felt that owning a stereoscope was the next best thing to being there. The stereoscope gave 19th – century Americans 3-D views of their frontier landscapes. During the ’20s, a culture of traditions and commerce grew up around the park and the large staff who began working there each summer to accommodate the boom in tourism. The Larsen Collection contains various souvenir books that were sold in the park—both professional items produced by official park photographer F. J. Haynes and scrapbook-like products that allowed travelers to insert their own photos and write down memories. Though laundry services were available at places like the Old Faithful Inn (courtesy of the “pillow punchers,” or lodge maids), many tourists staying in the Upper Geyser Basin during the early 20th century preferred an alternate method of keeping their personal effects clean. Photographs from the scrapbook of Lawrence and Lorna Maycock, Jean’s parents, on their honeymoon in Yellowstone in 1923. ‘Laundry Spring.’ We could see an opening downward, a sort of cavernous opening, the walls were coated with sulphur mingled with a green substance all flashing in the sunshine.” Unfortunately, so many enthusiastic visitors attempted to wash handkerchiefs in this spring that it was clogged in 1929, and placing anything in a thermal feature in Yellowstone was later declared illegal. Jean and Dean Larsen visit Artist Point’s in 1988. The couple donated their personal collection of more than 2,000 Yellowstone items to BYU and established an endowment for the collection’s continued growth. Dean and Jean Larsen traveled all around the world together, but it was to Yellowstone they returned every year, including in 2001, the year before Dean died. “Yellowstone is home,” Jean says, simply. And Jean and curators Taylor and Draper all emphatically agree that you haven’t seen Yellowstone until you’ve seen it with Dean. One of the largest and finest collections of Yellowstone materials in the world, the Larsen Collection is replete with publications describing how, and how not, to interact with the wildlife. As was intended, many of those marvels have remained largely unchanged in the 136 years since the creation of Yellowstone National Park. Going back to nature in the 21st century may mean sharing it with tens of thousands of other adventurers on any given summer day. But on the south rim of the Grand Canyon of the Yellowstone, signs lead to Artist Point, which still affords Moran’s famous vista from the edge of the rugged cliffs. Travelers from around the world line a boardwalk every hour to see Old Faithful put on a show, muttering, “Come on, come on … ,” and holding cameras at the ready as the geyser’s jet starts to rise. Nearby, Castle Geyser’s sulphurous smell and brilliant hues are as strong as they ever were. Fishing is no longer allowed on Fishing Bridge, but families come anyway, leaning over the railings and watching pelicans fly and land in graceful formation on the smooth water of the Yellowstone River. And across the river in the general store, wide-eyed children still peruse the merchandise, pull coins from pockets, hold tightly to their new treasures, and understand—perhaps for the first time—that they belong to this place, and it belongs to them. Riley Lorimer is an editor at the Joseph Smith Papers Project. As an 8-year-old on a summer vacation in Yellowstone, she spilled milk on her shorts at dinner and left them atop the tent pole to dry overnight. The shorts froze solid. More info: To learn more about the A. Dean Larsen Yellowstone Collection, e-mail larry_draper@byu.edu.